With the grace of God Jalsa Salana of Jama’at Ahmadiyya UK starts from next week. Volunteers have been busy for past several weeks at Hadiqatul Mahdi preparing for Jalsa. These preparations by Khuddam and other volunteers have intensified in the last ten days. It is no mean feat to make all the arrangements on what is essentially farmland. Khuddam from various parts of the UK and other volunteers do this task with amazing skill, and no example of this can be found in the whole world in any other organisation. It is a grace of God that He has instilled this passion in young men and others after taking Bai’at of the Promised Messiah (on whom be peace). Sunshine or rain these young men serve selflessly for Jalsa Salana as initiated and established by the Promised Messiah (on whom be peace). And during Jalsa days thousands of other volunteers will join them to serve the guests and to make the operations of Jalsa Salana run smoothly. Later, a lot of time is required to wrap up the entire setup. These volunteers will be men, women, girls, boys, children and the elderly. Thus is the extraordinary passion to serve the guests of the Promised Messiah (on whom be peace) which cannot be found anywhere other than the Jama’at of the Promised Messiah (on whom be peace). Worldliness and materialism is the norm of most in the Western world and it is in this world that these Ahmadi young people volunteer themselves most humbly to serve in this manner. We should pray for them that may God enable them to do their tasks in a most excellent manner and protect them from all evil and trouble. In line with his practice Hazrat Khalifatul Masih spoke on the subject of hospitality in today’s sermon saying that it is indeed the need of the time to do so. There is no doubt that all volunteers serve with all due effort and attention but there are always some newcomers joining in and children serving for the first time and of course reminding those who have served before is also necessary. So that they may keep the blessed model of the Holy Prophet (peace and blessings of Allah be on him) in view and be mindful of the practice of his true and ardent devotee the Promised Messiah (on whom be peace) so that higher still standards are achieved. The Holy Qur’an mentions the hospitality of Hazrat Ibrahim (on whom be peace). Upon receiving guests his first response, after welcoming and greeting them with peace, was to have a meal prepare for them. Hazrat Lot’s concern for his guests is also mentioned in the Holy Qur’an lest his people troubled them. Inconvenience of guests is not something that should be overlooked. Inconvenience of guests in any shape or form is an embarrassment for the host. This is why Islam enjoins respect and esteem of guests. The extraordinary qualities of the Holy Prophet (peace and blessings of Allah be on him) that Hazrat Khadija (may Allah be pleased with her) enumerated at the time when after receiving his first Divine revelation he was perturbed included his quality of superlative hospitality. There are hundreds of examples in his blessed life where he exhibited most excellent manner of esteem and respect for guests. He also taught these qualities to his Companions who went on to demonstrate great acts of hospitality which were blessed by God. It was the practice of the Holy Prophet (peace and blessings of Allah be on him) that when a lot of guests came he divided them among his Companions and took some guests for himself. A Companion narrates that he was once among the guests the Holy Prophet (peace and blessings of Allah be on him) allocated himself. He took the guests home and asked Hazrat ‘Aishah (may Allah be pleased with her) if there was anything to serve them. She said there was a little something which she had put away for the Holy Prophet (peace and blessings of Allah be on him) to break his fast. He asked her to serve the food. The Holy Prophet tasted a little of the food and then gave it to his guests. They ate without looking and were satiated. The Holy Prophet (peace and blessings of Allah be on him) then asked if there was anything to drink. Hazrat ‘Aishah served a beverage which the Prophet first tasted and then offered to his guests who were again satiated. The reason the Holy Prophet (peace and blessings of Allah be on him) first tasted the food and drink himself must have been to say a prayer to bless the food so that it would be enough for all to eat. There are dozens of other accounts of the Holy Prophet blessing food with prayer. Sometimes guests can create very awkward situations for their hosts which can be very challenging but the lofty example of the Holy Prophet (peace and blessings of Allah be on him) was such that once an overnight guest left in the morning leaving behind soiled bedding, perhaps due to an upset stomach or deliberately due to animosity. Rather than complain, the Holy Prophet (peace and blessings of Allah be on him) proceeded to wash the soiled bedding himself. Owing to such amazing acts the Companions also made huge sacrifices for their guests. The incident which is indeed an exceptional account where a Companion got his children to go to sleep on some pretext because guests had arrived and there was only enough food in the house to feed the children. When the Holy Prophet (peace and blessings of Allah be on him) sent some guests over to him, the Companion and his wife decided to put their children to sleep, then bring the food over to the guests but extinguish the lamp on some pretext and then only pretend to eat in the dark while the guests ate to their satisfaction whatever food there was. Next morning when the Companion went to see the Holy Prophet (peace and blessings of Allah be on him) he laughed and said that his planning to feed the guests the night before was such that it had also amused God. God was so pleased with it that He informed the Holy Prophet (peace and blessings of Allah be on him) of the whole incident! The Holy Prophet (peace and blessings of Allah be on him) said a person who believes in God and the Day of Judgement should say something good or else stay quiet. A person who believes in God and the Day of Judgement should respect his neighbour. A person who believes in God and the Day of Judgement should honour his guest. The Holy Prophet (peace and blessings of Allah be on him) also used to inquire from the guests how they found the hospitality extended by the Companions. On one such occasion a guest said O Prophet of God they gave us soft bedding to sleep on and fine food to eat and they also educated us about the Book and Sunnah. Thus are the obligations of a host. People who are expecting Jalsa guests at their homes should not spend evenings in idle chatting but should have religious discussions and should impart religious knowledge. At Jalsa we also have guests outside the Jama’at. Volunteering hospitality teams at every accommodation location should exhibit great models so that the guests appreciate that they have come to a religious convention. Whenever they have free time, be it day or night, rather than spend time in idle chatting, they should have religious conversations. This will have a good impact on the guests and they will realise that Ahmadis come together in these three days having really cut themselves off from worldliness. The Companions of the Holy Prophet (peace and blessings of Allah be on him) were not only great hosts in terms of providing the best accommodation, food and drink that they could, they also met the spiritual needs of their guests so that on return home the guest may relay the teachings to others. We have Tabligh and Tarbiyyat departments. Providing spiritual sustenance is the task of the duty-holders and it should be undertaken in an excellent manner. Good word and deed of volunteers is also part and parcel of hospitality. In this age the true and ardent devotee of the Holy Prophet (peace and blessings of Allah be on him), the Promised Messiah (on whom be peace) also established great models of hospitality. A guest visiting Qadian who had taken Bai’at and had a relationship of being a follower of the Promised Messiah (on whom be peace) was massaging his feet out of reverence. Just then a Hindu knocked on the door. The companion got up to answer the knock but the Promised Messiah (on whom be peace) hastily got there first. He said the companion was a guest and the Holy Prophet (peace and blessings of Allah be on him) has said that guests should be honoured. Here, we observe two aspects. He had allowed the companion to massage his feet owing to him being a follower but in his capacity as a guest the Promised Messiah (on whom be peace) promptly extended respect to him by answering the door himself and also greeted the person who had come. Once an Ahmadi guest travelled to Qadian during winter months to meet the Promised Messiah (on whom be peace). It had been raining and he arrived in the evening. He had his evening meal and went to sleep. There was a knock on his door quite late in the night. He was astonished to see the Promised Messiah (on whom be peace) on the doorstep holding a glass of warm milk in one hand and a lantern in the other. He said some milk had come by so he thought of offering it to his guest who was probably used to drinking milk. The guest was indeed moved to tears to see one commissioned by God serving him! The Promised Messiah (on whom be peace) used to take care of special dietary preferences of people of different regions. Due to management reasons, at the time of Jalsa however, only one kind of food was prepared. Nowadays the Jama’at has progressed in terms of management and resources and a general Langar operates as well as other foods are also provided. There is no problem in this and there is also nothing wrong in this. Some people pointlessly raise objections. They should show tolerance. In order to let the outside guests, who are usually known as Tabshir guests, know what is generally served at Jalsa, Langar food should also be served to them. Some eat it eagerly. The main point is that this special food arrangement was not possible at first but it is now and this is why it is carried out. This arrangement used to be available in Rabwah as well. Indeed, Ahmadis should in general eat what is cooked for everyone as should the duty-holders, unless they have special dietary requirements due to health reasons or are on duty with special guests, then they should eat with the guests. Once during the times of the Promised Messiah (on whom be peace) due to management mistakes guests were not served food properly. God informed the Promised Messiah (on whom be peace) of this and he said that God had informed him that the previous night there was hypocrisy in serving food to the guests. The Promised Messiah (on whom be peace) dismissed the Langar workers for six months. In spite of his gentle nature he did not tolerate deficiency and hypocrisy in serving guests. He then personally overlooked Langer operations. Hospitality department needs to very careful. No one should have any complaint in any shape or form. Hospitality does not only entail serving food. It entails management of Langar, serving food, storage and supply of food. Indeed any laxness in supply can cause delays in serving food. Hospitality includes accommodation, which should be properly provided. There is also the system of cleanliness, both general and of toilets. Car parking facility is also included in hospitality. Any chaos in this can inconvenience guests as well as disturb Jalsa programmes. Then there is the work of extensive tracks laid to deal with wet weather, also buggies ferrying the elderly and disabled and the shuttle services to Hadiqatul Mahdi from a couple of outside car parking facilities. In short there is much work that comes under hospitality. If these tasks are done properly everything else falls in place. Medical Aid also comes under hospitality. In short 80% or more of Jalsa tasks come under hospitality. Everyone should remember that hospitality is not only the task of those who wear a badge with hospitality emblazoned on it. Hospitality is the task of almost all duty-holders. Today is 14 August, Independence Day of Pakistan. In this regard prayers should be made that God grants real independence to Pakistan and keeps it protected against self-centred leaders and clergy. May God give sense to the public to choose leaders who are honest and will honour trusts! May they understand that the permanence of the country lies in justice, paying each other’s dues and in turning to God! Barbarity is perpetrated in the name of Lord of all the worlds, Most Gracious and Ever Merciful God. In the name of God and His Messenger who was mercy for all mankind. Barbarity is perpetrated all over, against Ahmadis who played a vital role in the creation of the country and gave sacrifices! Yet no matter where in the world they are, Pakistani Ahmadis have to be loyal to the homeland, may God safeguard the country! The country is in more in danger of home-grown rather than external threat; from self-centred clergy and leaders. If they ran the country with fear of God, no external power could harm the country. Pakistani Ahmadis should pray as much as they can for the country that may God keep it safe and secure. Kamal Aftab Sahib of Huddersfield UK passed away of leukaemia on 7 August 2015 at a Leeds hospital at the age of 33. He was enabled to serve the Jama’at in various capacities. At the time of passing he was the regional qaid for Yorkshire as well as secretary tarbiyyat for Huddersfield South. During his illness he started a ‘hospital marathon’ from his hospital bed to raise £50,000 for Leukaemia research. He selflessly worked till his last breath on different projects to serve humanity and on Tabligh. He had a most sincere and loyal connection with Khilafat. 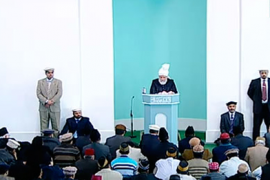 In spite of his illness and weakness he arranged for an MTA connection in his hospital room to watch live broadcast of Huzoor’s address to the last Khuddam Ijtima. National daily The Guardian awarded him Volunteer of the Year 2014. He came to meet Hazrat Khalifatul Masih a few days before passing. Despite his illness he was most resilient and cheerful and did not show any sign of being in pain although he would have been in quite a lot of pain at the time. He always had a very sincere and loyal connection with Khilafat. His brother Farooq Aftab writes that he was the great grandson of Seth Allah Ditta Sahib, a companion of the Promised Messiah (on whom be peace). His grandfather’s house was unsuccessfully attacked in the troubles of 1974 and his grandfather was imprisoned as a prisoner of conscience for six months. Kamal Aftab was very amiable, courteous, courageous person who helped others and was liked by everyone. Both Ahmadis and non-Ahmadis admired him and one heard nothing but praise about him. He was popular among young and old and was friendly towards everyone. He served his parents well and was looked after his siblings. He was specific about observance of Salat and was at the forefront of service to mankind. He was the project leader of Humanity First programme Gift of Sight and had been working on plans to make an eye clinic in East Africa. He was an active Tabligh worker who did not let go of any chance to do Tabligh. During his time in hospital he introduced the Jama’at to the doctors and other care workers. He arranged to receive MTA in hospital where he showed programmes to others and this opened avenues of Tabligh. He was an active member of Majlis Ansar Sultanul Qalam. He gave hundreds of interviews to radio, TV and newspapers sending message of Islam to thousands. Kamal Sahib’s other brother Yousaf Aftab writes that he would personally try and bring those Khuddam and Atfal who did not have a strong connection with the Jama’at, close to it. He tried to instil love of Khilafat in hearts. Sometimes he brought Khuddam to Fazl Mosque London so that they could offer Salat behind Hazrat Khalifatul Masih and forge a connection with him. He drew attention of Khuddam in general and amila members in particular towards observance of Salat and also took practical steps to achieve this. He would take some Khuddam to the mosque for Fajr Salat. Dr Aziz writes that after he was diagnosed Kamal Aftab said he was fine with whatever was God’s will. His greatest concern after being diagnosed was that the interviews prepared after Humanity First work on the Nepalese earthquake should be uploaded online so that the world knew the Jama’at’s service to humanity. His illness was a painful illness from a medical point of view but he remained smiling. During his time in hospital he said no Tabligh opportunity should be lost because the Promised Messiah (on whom be peace) had expressed his wish that had he known the English language he would have done a lot of Tabligh in it! Our press in-charge Abid Waheed writes in addition of his various services to the Jama’at, Kamal Sahib made many new media links for the press office. In spite of his illness he urged journalists via telephone and email from his hospital bed to attend Jalsa. After the central media team was made he would often call to find out about efforts of Adam Walker. If he felt work was lacking he would get very emotional and say we should appreciate the significance of our work. At Jalsa he would appear fresher than the rest despite not having had enough sleep and his positive outlook had a very good effect on others. He made new contacts unhesitantly and without fear. He became a source of taking the message of Ahmadiyyat to the media even in death. BBC, ITV and Belfast Telegraph etc. have published articles on his passing. Famous people have paid tribute to him on social media. ITV journalist Heather Clark said as a journalist she should not be lost for words but she was most saddened at Kamal Aftab’s passing. She said the good died young and we should now keep his name and his work alive. Margaret Emsley, Head of News ITV Yorkshire said Kamal Aftab was a very good, kind person. Seeing him one felt he had spent a very happy and fulfilled life. She added we will pay tribute to him on TV. Sadr Huddersfield Jama’at writes Kamal Sahib was extremely obedient and had a connection of intense love with Khilafat and the Jama’at which inspired admiration. He was extremely regular at offering Fajr Salat and had great passion to serve humanity. If ever he was delayed in submitting report and was asked he would be apologetic. Muhammad Ali Sahib of Hartlepool writes last year he went to Ireland with Kamal Sahib for Waqfe Arzi. Kamal Sahib was the regional qaid and Muhammad Ali Sahib a local qaid. Yet Kamal Sahib appointed him the leader for the trip and throughout the trip extended respect and deference to him. He made special arrangements for Tahajjud and did Tabligh passionately and asked our Irish missionary Ibrahim Noonan Sahib what was the best way to do Tabligh to Christians. Other Khuddam have also written tributes to Kamal Sahib. Former Sadr Huddersfield writes he knew Kamal Sahib as a child. He was different from other children. He did not have fights, was not cheeky and was respectful of elders from childhood. He was intensely passionate about serving Jama’at. It would not be an exaggeration to say he truly abided by his pledge. One Khadim wrote that Kamal Sahib liked to serve from the background and did not court the limelight. He had deep love of Qur’an and Hadith and whenever a translation of a book of the Promised Messiah (on whom be peace) was published in English he would immediately inform others. He was a person of countless qualities. May God elevate his station and grant steadfastness, patience and assuagement to his elderly parents and grant resilience to his brothers and near and dear ones. Muhammad Naeem Awan Sahib 36, and his 12 year old son passed away by drowning in the River Rhine. Naeem Sahib was visiting family in Germany along with his wife and children. He was swimming in River Rhine when high waves were created due to two passing ferries. They were engulfed by one of the high waves. A German rescued three family members but when Naeem Sahib went to rescue his 12 year old son who was in trouble both father and son were overcome by a huge wave. Naeem Sahib had moved to the UK from Germany in 2005 and was an active member of Khuddam here. He had performed Umrah in 2012. He was a very affable and friendly person. He leaves behind a widow and two daughters. Farooq Aftab Sahib writes he had known Naeem Sahib for many years. He was a pious person who helped others but never burdened anyone with his own matters. He used to take a month off work around Jalsa to carry out every kind of heavy duty work. May God elevate his station and Himself look after Naeem Sahib’s daughters.